Why are we spending billions on energy retrofit programs, climate change research, environmental consultants, and conservation, when we are spending next to nothing to slow down population growth? We're putting a lot of resources into energy efficiency, but all that goes to vain when we ignore rapid population growth. We can't allow ourselves to go beyond 10 Billion, or there will be severe consequences for our quality of life, and environment. We need a plan for humanity to survive at least another 1000 years, and ethical depopulation might be the solution. Are we simply going to ignore the issue, and let countries like India and China get over 2 billion? How will future generations maintain a high quality of life, when the resources start to run out? What will the quality of life be like for them, when they can't get access to affordable food, housing and transportation? The people living in mega-cities are becoming alienated from nature. The quality of life diminishes when they spend 2 to 3 hours a day stuck in traffic. We are running out of farmland, and we don't need to watch the Amazon get destroyed, in order to make room for new farms. By gradually reducing the World's populating, we could start to regrow forests outside cities, providing a beautiful landscape and recreation opportunities for future generations. How do we proceed with aggressive action on overpopulation that will be ethical, and not interfere with humans rights? 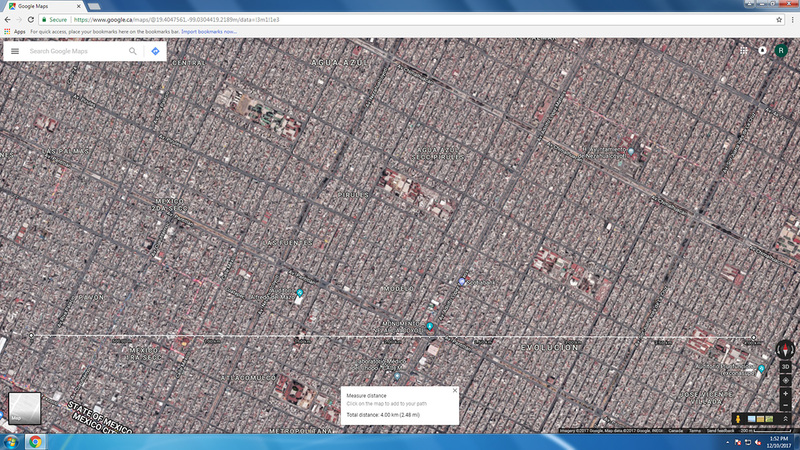 I give you a picture of Mexico City, showing 16 Square kilometers, without a park or woodlot. How do we get nature back in a rapidly growing city? The dilemma is there is no "ethical" way to depopulate. I've been writing and talking about it since 1967. Nixon addressed Congress on it in 1969 and they chickened out. So did everyone in power since. It looks like catastrophe is the only way, and that is mass death, with not much positive selection of survivors. There is a very good possibility there will be our own extinction, along with most other species we take down with us, even without a methane turnover event like the Permian or equatorial superrotation developing like Venus and Saturn, Jupiter and Neptune. It could well be that the present existing open ocean effect runaway is already into Arctic methane release runaway. A very large aerosol event like Toba might stop it, or Divine Intervention. I pray for God Himself to stop the destruction of the biosphere. One of the problems is, overpopulation makes money for the elite. Globalist can outsource jobs to high growth countries, and make billions off an endless supply of cheap labor. Real estate speculators need rapid population growth, to drive up the price of their holdings. Depopulation is going to put transnational corporations out of business. Liberals won't talk about population growth, because they believe it's the 1% telling the 99%, how to live their lives. I don't think anyone needs a family larger than 2. You want a 3rd person in your family, you adopt. We could implement compulsory vasectomies after a father has his second child, but the political backlash would be to severe. So we could spend billions promoting volunteer vasectomies, after the second child. We must encourage as respect family size, up to the second child. Promote personal finance and parenting education in schools. We need liberal environmentalist to recognizes that "all roads lead to overpopulation". Manmade climate change wouldn't exist without overpopulation. Deforestation would be less severe without overpopuation. The oceans would have more fish without overpopulation. To say that westerners are greedy, and Africans aren't, because they use less energy is false. They would acquire our wealth, and consume, as much as we do, if given the change. Instead of demonizing personal consumption, we need to slow down and than reverse rapid population growth. The price of housing and food would go down, as demand decreases. The quality of life for the average citizen would go up, with a gradual and ethical depopulation. In Europe, many countries are making the mistake, of providing incentives to increase their population. Virtually every country, except Greenland needs to depopulation. China and India should talk highest priority, followed by Africa and Latin America. We need to come up with the concept of "Ethical Depopulation". It we advocated for a documentary to be made, as power as "An Inconvenient Truth". It might be a good idea. We need to sell the concept of "Ethical Depopulation". Having a birthrate solution, while have a 2 child global target. If we could reduce the population by 5% per decade, I think the planet would have a chance. Work with dozens of researchers, put your best information together, and get this documentary made. We need to put all our best arguments forward. The arguments you present were the same as 50 years ago when there was less than half the present severe gross overpopulation. Even a moratorium on having kids is not enough to stop it. Even no people or emissions at all is not enough to stop thermageddon. 50 yers ago 2 child families forced worldwide would have worked to stop what is happening now, then around the mid 80s for one child families to work along with all green practices forced upon people, then it fell below one by 1998, with 10% emissions. With an aerosol event like Toba, one out of a thousand survives underground for half a generation. Then the CO2 needs removal by building 5000 CO2 to carbonate factories, and a thousand year cleanup of the ocean plastic and surface toxic wastes. If there is an aerosol event, we go directly into the ice age for 90K years or so, and by the next interglacial epoch we may have a healthy biosphere again. Otherwise it is 100K years of blackness under thick global clouds with hundreds of large storms and continuous lightning, followed by several million years to re-evolve life. Just like the Permian Great Dying, same mechanism of methane turnover. Future generations were murdered by too many kids of previous generations, and they also killed all life except cyanobacteria and extremophiles. Too little too late has been the human way of greed and stupidity. Praying to God for a large miracle is in order. It doesn't mean we give up, and let things happen without intervention. I have an ethical solution to overpopulation. Instead of sponsor a child, it's called "sponsor a vasectomy". The most racist thing we can do to the third world, is ignore it, and let them breed at unsustainable levels, while the globalist continue to exploit their endless supply of cheap labor. If $100 could pay for 50 vasectomies, i'd give that money in a heartbeat. As third world populations start to stabilize, wages would start to go up, and their quality of life, and environment would improve. I'd only have one condition, the vasectomy can only be performed after a fathers second child. We have to respect the dignity of a normal family size. I think that's an ethical compromise, that still encourages parenthood, at a reasonable level. I would also refuse to pay a carbon tax to environmental scammers, until the agree to use that money to pay for ethical solutions to fight overpopulation. We shouldn't tolerate the hypocrisy. Take this conversation to other forums. And sell the concept of "Ethical Depopulation" as a solution to the environment, climate change, and quality of life, for the world's citizens. Let's lobby for wide-scale vasectomies programs to be paid for by governments, and charities. Start a research pool, and get documentaries made. Demand that media cover this issue. Overpopulation is the number one cause of climate change, but their are ethical ways to slow it down. Do not compromise on political correctness, but be as ethical as possible. The planet is going to have to support the needs of not the present, but all future generations going forward, for thousands of years. Preemptive ethical depopulation could prevent a lot of misery and death. It might take 50 years or 100 years, until the real economic and environmental collapse happens, but right now were setting up the perfect storm for that to happen. Overpopulation is the Trojan horse, so don't be on the wrong side of history. By preventing unnecessary births, we're preventing miserable deaths in the future, weather it be plague, economic, environmental collapse, or another world war. It's only a matter of time. Maybe the system will stay intact another 200 years, don't bet on 1000 years. The right thing to do is find ethical ways to depopulate, until the planet can support all generations going forward. Mother nature gets to decide who wins. I agree with Robert's idea. Also, support the ideology that we can have only two children per family = to replace parents. Only this approach is sustainable. The lack of intelligent people having children is offset by the increased number of lesser intelligent people having more children. Thus, we have the "Idiocracy Effect" on our society. The dumbing down has been going on especially since Earth Day One. In my research I estimate a drop from 100 average to less than 94. Even before, 1966: "Unlike plagues of the dark ages or contemporary diseases we do not understand, the modern plague of overpopulation is soluble by means we have discovered and with resources we possess. What is lacking is not sufficient knowledge of the solution but universal consciousness of the gravity of the problem and education of the billions who are its victim." It was bad then, and has doubled since. It was not sustainable then, and is sheer ignorance to say it would be now with replacement level of 2. I suppose it is the rose colored glasses viewpoint of someone too young to know how it was. Even now, if no kids were born and everyone died and then there were no more HGHG emissions, the 5.5 Billion Hiroshima atom bombs worth of heat added to the oceans by the effects of HGHGs previous would still melt the Arctic summer ice by 2021. This lets loose the latent heat effect and uncaps thousands of GTs of methane. The resultant abrupt heat gain kills off all surface life in a relatively short time, similar to the Permian Great Dying. An aerosol event like Yellowstone or Uturuncu super volcanic eruption could cool it down with a population bottleneck for most surface species with a 10*F or more cooling for 10 or more years. If in time, because it is a race to beyond even that cooling capacity. I'm worried we are entering an age that is anti-human and anti-family. The most important job in someone life is to be a parent, but we don't teach about parenting or personal finance in high schools. That's the problem. We need to actually encourage children up until 2, but have strict methods of limitations beyond that. It's unethical to expect some people to sacrifice by having no children, while others continue to have 3 or more. No one should feel guilty about having one or two children. If were against parenting, then we end then we're against the continuity of humanity. Will become spiritually, and culturally extinct, before mother nature gets to us. We need to stop both extremes. We can't have too much children, or too few children. The educational system needs to prepare students for parenthood, instead of only giving them exam anxiety, so they aren't really learning. The school system doesn't teach students how to respect their girlfriends, how to have pride in community. They beat them to death with math equations 95% of them are never going to use. Last edited by Johhny Electriglide on Thu Feb 08, 2018 12:40 pm, edited 1 time in total. Parenting and functional family becomes a taboo. (Speaks someone raised without a father - which affects my way of dealing with many life situations since then). the government dictating how many kids you have would never happen because people would not be willing to give the government that kind of control. perhaps education on the benefits of a smaller family and the environmental impacts would be best. i didn't learn anything about sustainability (other than water) when i was in school. I was thinking the same thing, what do you mean by liberalization? I would argue that Japan is even less liberalized than the US if I have the same definition as you.